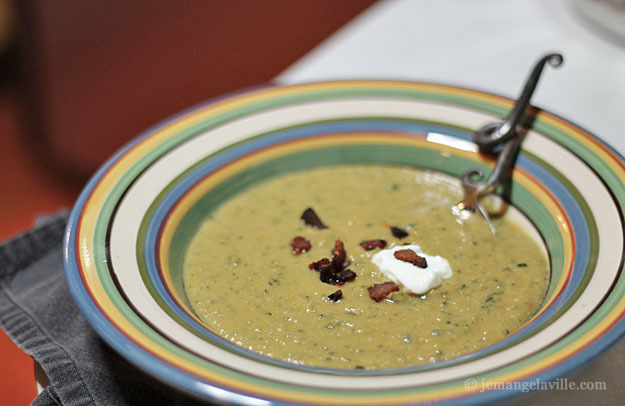 Hello French Fridays with Dorie and this week’s Orange Scented Lentil Soup recipe. How are you? Well, I thought you were delicious! I tend to have the opinion that, although lentil soups are in standard rotation at our house, they can be kind of boring. But not this bowl — the orange and spices are definitely different flavors than I normally go with and I think that really made this recipe a huge stand out. Of course, I did a few things differently. I had about a cup of lamb braising sauce (sorry, Morrissey! *) leftover from the lamb shank adventure last weekend and I substituted that for about one cup of the broth (the miracle of lamb fat). 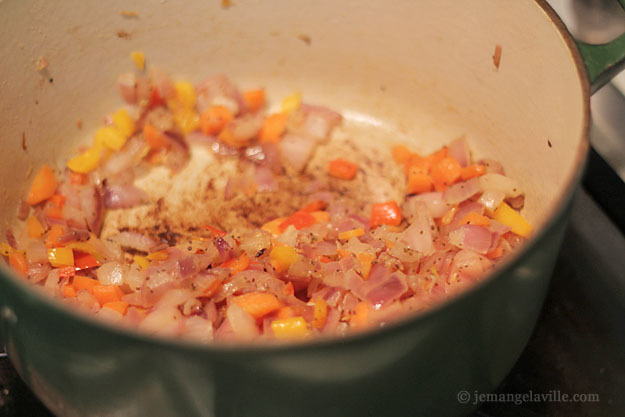 Other changes: I let my vegetables get a little brown in the beginning for more flavor. I also added some chopped kale at the end and I used red lentils instead of French green lentils. Because of that, I was able to shorten my simmering time by about 15 minutes. 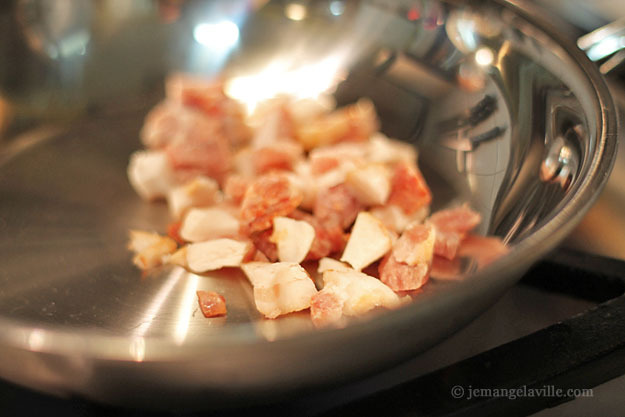 For garnishes I used the suggested crumbled bacon (oops!) and Greek yogurt. So good. 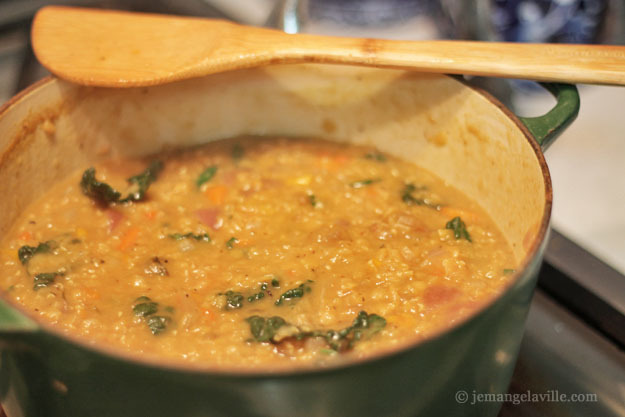 Here’s a link to everyone’s Orange Scented Lentil Soup this week. As usual, all of the French Fridays with Dorie recipes are in the cookbook, Around my French Table, by Dorie Greenspan. 1. I can’t believe it’s been 27 years since I saw The Smiths in Chicago in 1986 (at the Aragon Ballroom), 2. Holy crap. 27 years let’s make that 26.5 years to be completely fair and accurate, 3. I (still) love, love, love The Smiths, 4. Although I think I could be a vegetarian again (I was one from when I was 17 until about 26), I don’t really want to…because…bacon, 5. A show that starts at 9pm is pretty harsh when you are 40-something and you’ve been up since 6:30 AM, 6. Morrissey!!!@#! Ooooh, did he sing a lot of Smith’s songs? He came through Reno recently and I was very tempted… Your rendition of this soup looks very good – perhaps I should try again with some of your changes. The pic of the soup in the pot is the most appealing, with the green kale. This is a good recipe, but I like the idea of adding a green leaf. Beautiful soup. 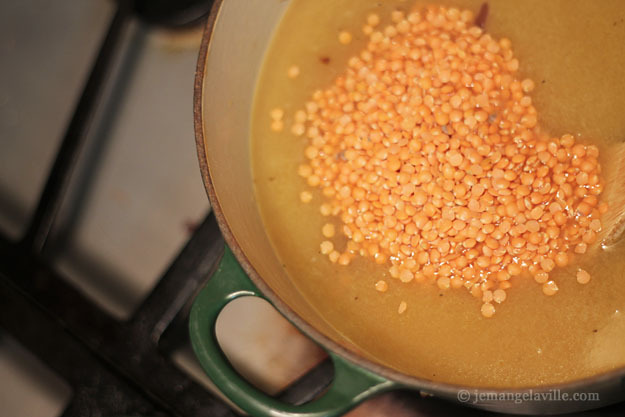 Well, I never find lentils boring, maybe mild and comforting but I have found childhood memories connected with lentils Your soup is fabulous tres tres chic much more interesting than Dorie’s. I think I must be the only person in this group who didn’t have lentils until I was well into my adulthood. No childhood lentil memories. The red lentils gave your soup such a lovely color! It looks and sounds so delicious! Wonderful changes!